The Paralogg is an insole pressure measurement system used to determine average pressure and average timing values across the foot. The paralogg pressure measurement system consists of insoles with built-in pressure sensors placed within the shoe. 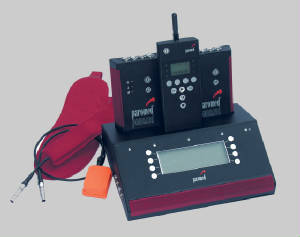 These sensors allow for measurement of static and dynamic values of average and peak pressures, average and peak timing values, and overall force lines indicating positioning and weight distribution throughout each phase of gait. This measurement system allows us to give quantitative values indicating the precise effectiveness of offloading, and changes in gait biomechanics measured in N/cm2. Initial readings are taken in the patient’s current shoes, and readings are also taken with the new biomechanical device to compare and contrast the amount of correction given. Who can benefit from Paralogg Measurements? Paralogg readings are ideal for diabetic patients, particularly those who are affected by sensory neuropathy. Since these neuropathic patients have reduced or limited sensation, the Paralogg gives us critical information on which areas of the foot need pressure offloading, and precisely how much offloading to give. With that said, any patient with complex issues regarding gait biomechanics or pressure distribution can benefit from a detailed Paralogg reading. Paralogg readings show average pressure values in N/cm2. Though certain factors such as footwear, patient weight etc. can affect the overall expected values, it is a general rule that high risk sites, such as ulcerations and heavy callusing, should show readings of less than 20 N/cm2 (blue/green sensors) in order for adequate relief and healing. Readings of over 20 N/cm2 greatly increase the risk of (red/yellow/black sensors) causing further damage to pre-existing wounds.